I am back again after nearly 2 long weeks! It's incredible how fast time goes by because I didn't even realise that it's been such a long time since I wrote something the last time. I keep repeating myself but I'm gonna say it again: I have absolutely no time to blog at all because all I do is going to uni or to work, I'm usually home late and then I try to revise a bit and I'm off to bed. I miss blogging a lot because I always enjoyed doing it and I'm so annoyed of this monotone lifestyle I have just now. Yesterday after work I finally managed to meet up with my best friend again after absolute ages, so this was a really nice day for me because I got to enjoy my time a bit again and meeting your best friends is always good! Today all I did so far is cleaning the whole house, which took me quite some time actually, and now I decided to sit down and show you a few bits of my flat that I probably like the most. 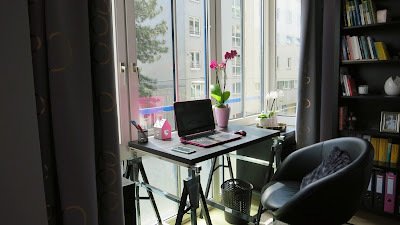 I don't really show my flat too much in my blog posts so I thought that those few photos will give you an idea of what it looks like. I worked hard on it and I'm not trying to brag in any way. I just love watching interiors and I think some of you might like that too. First of all: THE OFFICE. This was the first thing I thought of when I first saw the flat. The stunning patio-kind-of area, which has windows all around it is the perfect spot for a little home office. It is SO bright and sunny and I like the view from here. It's so quiet and it has the perfect size too. I knew this place was going to be exactly what I needed to study and to blog. So, all I have in here are two small chests of drawers on both sides of my desk, for all the small things that need to be organised, the desk, which is actually not quiet finished yet but I still love the look of it, a comfy chair and a big shelf for all my dictionaries, folders of flat-related documents and other bits and bobs. I have a nice carpet and pretty curtains with copper detailing too, plus a few plants to make it even cosier. I spend most of my time here. It's gotta be my fave spot in the whole flat. Those copper and black wire lamps have been so in for the last months that even before I moved house I knew I had to get one! 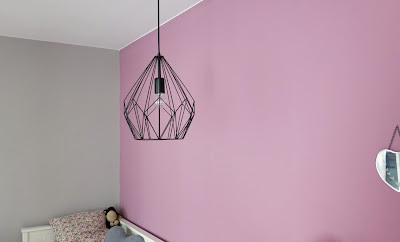 And even though I was first planning on getting a copper one, once we painted the walls it turned out that a black one would look so much more sophisticated and elegant, so just a few days ago I finally went and picked it up and I am in love! Next to my bed I have a little table/ basket thingy in the same style, so those two items just so together so well, plus some of the furniture is dark too, which is another reason why I got the black lamp instead of the copper one. Obviously, what else I love about my flat are the colours of the walls. Initially, I was thinking of a rather plain colour throughout the whole flat, but once I had to decide, I knew that I would have to choose a few wallpaints instead of only one. So, to keep it quite minimalistic I went for those cooler shades of greys and pinks and purples. 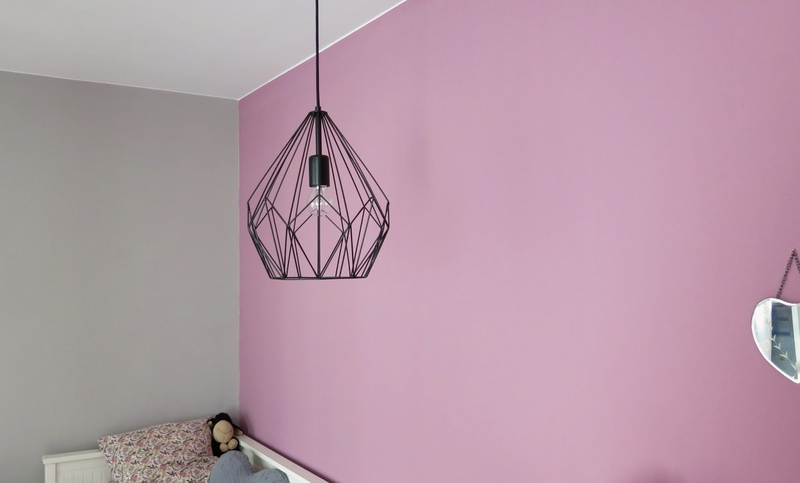 The hallway is silver, the entry area is a very dark grey with glitter, the kitchen is grey and purple and then my room is grey, dustpink and purple, plus the office is a delicate candy pink/lavender kind of mix. The colours are hard to describe since we mixed them ourselves. Everyone loves fairy lights, right? When my mum spotted these ball shaped ones in grey, white and pink she nearly went crazy because those are exactly the colours I have in this room. So, we had to buy them. There was no other way! 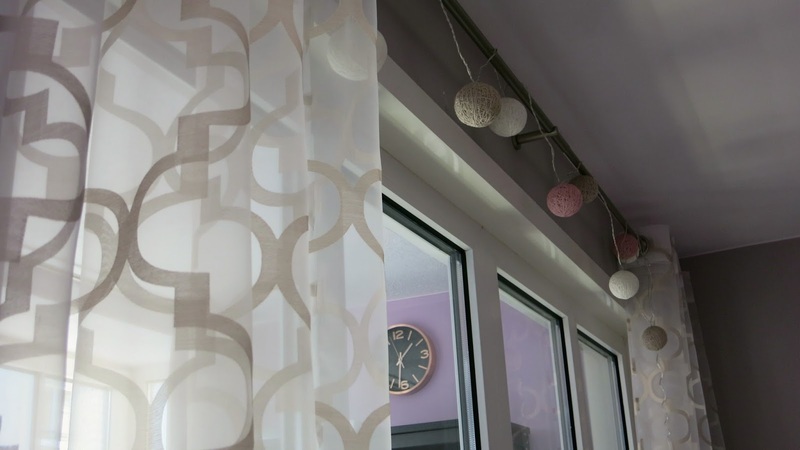 They are inside my room on the glasswall of my office and I have those sheer curtains on both sides with that cool scandinavian pattern. The fairy lights give a nice warm light that gives the whole room SUCH a comfy and cosy atmosphere. You would never want to leave, trust me! I hardly ever turn them on though, but even if they are not on I just love that little accent! We split my big room in a sleeping are and the living area with the sofa, the big armchair, two coffee tables and my old rug that is just too beautiful to get rid of ( which is why I told my dad to transfer it from my old room to my new room!). 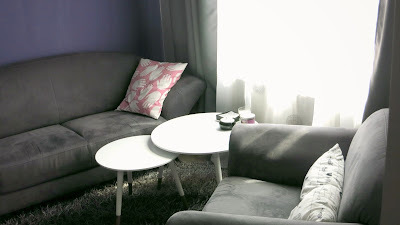 I love how the dark grey sofas go with the dark purple and also light grey walls. I bought those thick grey curtains in an ombre style, plus sheer white curtains with embroidered grey circles on them. And the grey carpet just matches everything so well too! I love this cosy area! I like having people over, sitting here together and having a chat. I think this pretty much makes a house a home.